Collect and analyze all the user requirements contained in SRD and OIRD that impact the FDIR to derive the objectives of the FDIR and define the impacts they will have on the S/C design from system level down to unit level. Allocate RAMS and Autonomy Requirements contained in SOFDIR per Mission Phase/Spacecraft Operational Mode in order to define FDIR approach and Autonomy Concept during different mission phases/Spacecraft Operational Mode. Model spacecraft FDIR architecture including all the involved subsystems (avionics, payload, etc). 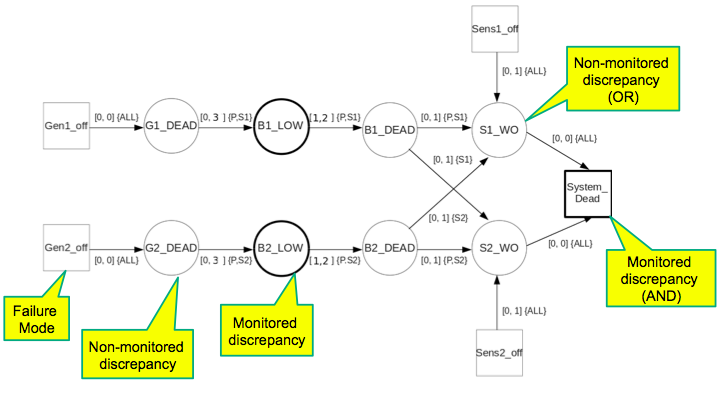 Specify FDIR Objectives at system-level specification in FOS and FDIR Strategies at subsystem level in FSS by using FDIR Analysis and TFPM Analysis Report. 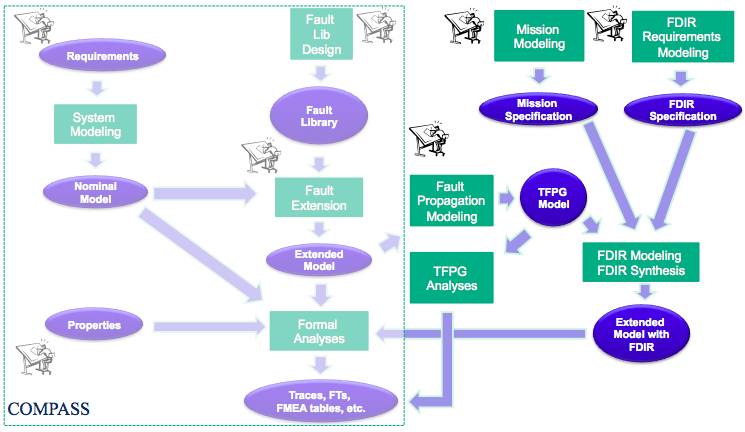 Specifies a timed failure propagation model (TFPM) for the design starting from fault trees, FMEA tables and Hazard Analysis. Design FDIR in the various subsystems, software and database on the base of FDIR Reference Architecture. Implement FDIR in hardware or software and validated and verified respect to specifications. The following figure shows the general workflow in the FAME Environment. A central component of the FAME process are timed failure propagation models. The specific models that are used in the FAME environment are TFPGs (Timed Failure Propagation Graphs). The following is a simple example for a system for which a TFPG was derived. The following TFPG describes the failure propagation in the battery sensor model (click to enlarge). Behavioral validation: tests fidelity of TFPG wrt extended system model. Effectiveness validation: tests whether sufficient TFPG nodes are monitored in order to achieve diagnosis objectives (diagnosability). TFPG Synthesis: A TFPG can be automatically derived from the extended system model. Synthesis of FD components (diagnoser synthesis). Synthesis of FR components (synthesis of recovery plans).